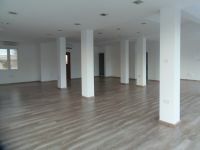 Shop / Showroom for rent in a prime location in Agios Dometios in Nicosia. The shop consists of 74 sq.m. on the ground floor plus 37 sq.m. mezzanine. Parking available. This shop in Agios Dometios, Nicosia is being offered for rent (long term) at EUR 1.500.